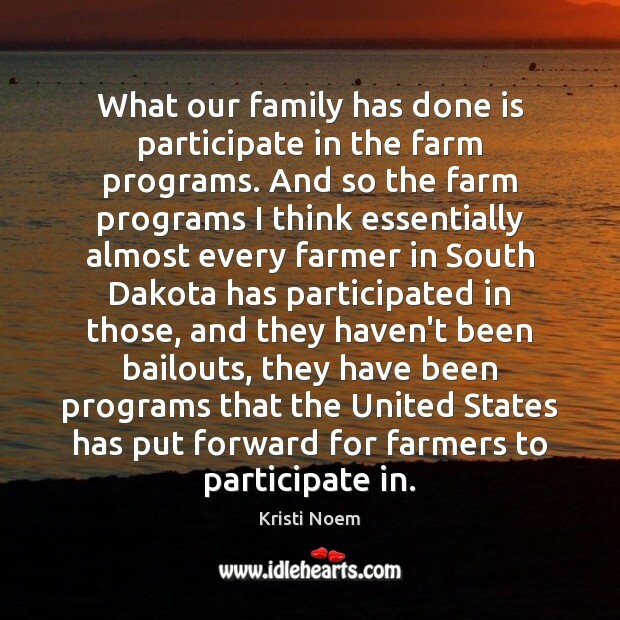 Quotations about Bailouts. Quotes to stimulate mind and drive action! Use the words and quote images to feed your brain inspiring things daily! 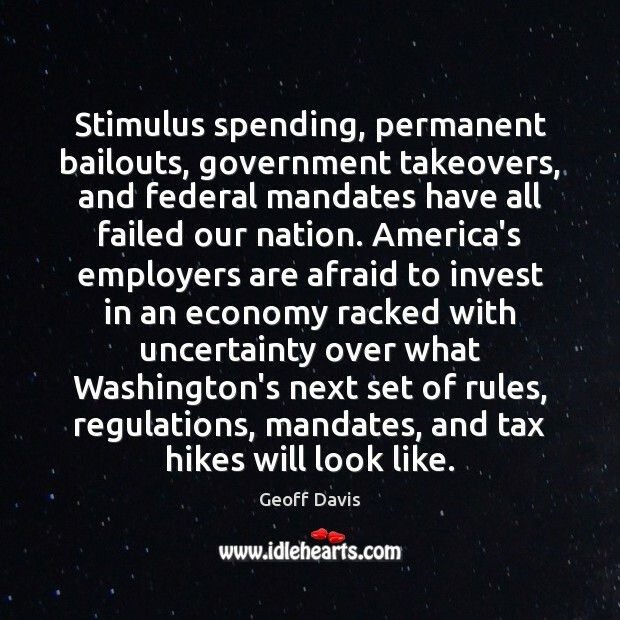 Stimulus spending, permanent bailouts, government takeovers, and federal mandates have all failed our nation. America's employers are afraid to invest in an economy racked with uncertainty over what Washington's next set of rules, regulations, mandates, and tax hikes will look like. 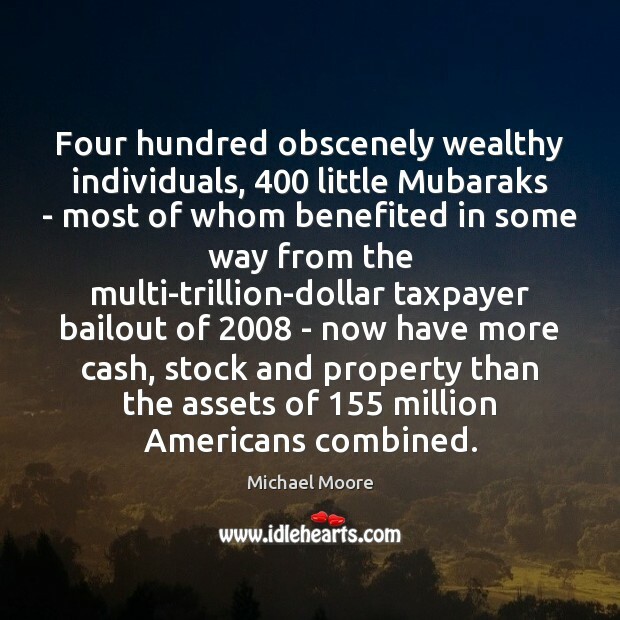 Four hundred obscenely wealthy individuals, 400 little Mubaraks - most of whom benefited in some way from the multi-trillion-dollar taxpayer bailout of 2008 - now have more cash, stock and property than the assets of 155 million Americans combined. 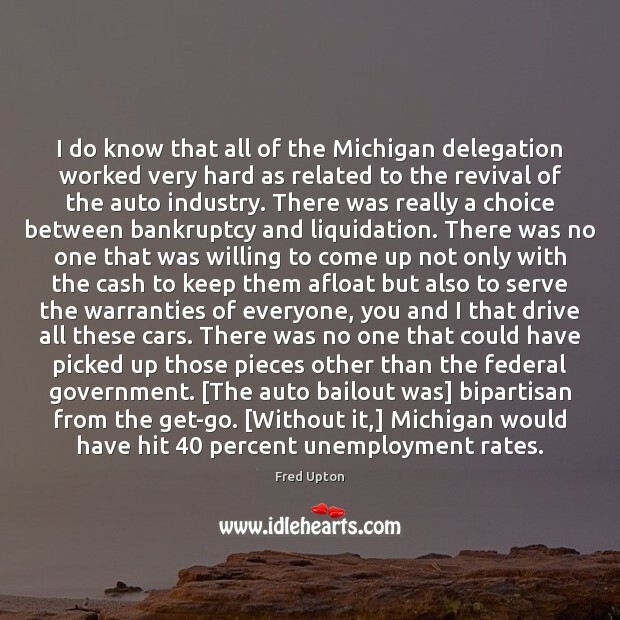 I do know that all of the Michigan delegation worked very hard as related to the revival of the auto industry. There was really a choice between bankruptcy and liquidation. There was no one that was willing to come up not only with the cash to keep them afloat but also to serve the warranties of everyone, you and I that drive all these cars. There was no one that could have picked up those pieces other than the federal government. [The auto bailout was] bipartisan from the get-go. [Without it,] Michigan would have hit 40 percent unemployment rates. 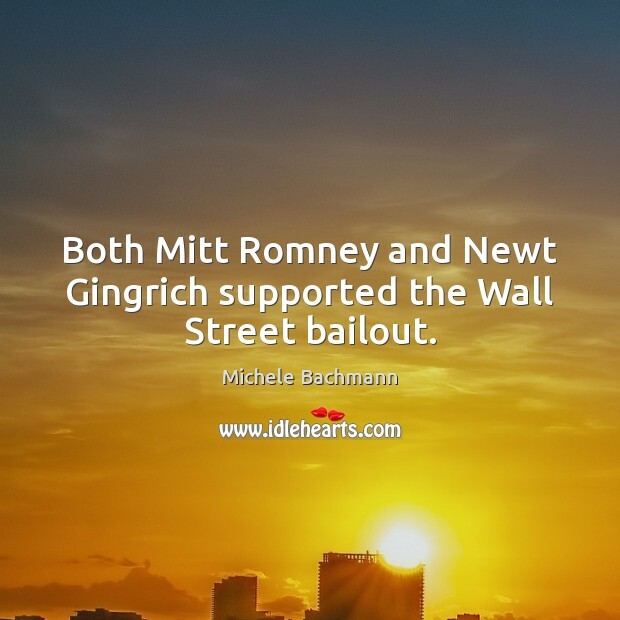 Both Mitt Romney and Newt Gingrich supported the Wall Street bailout. 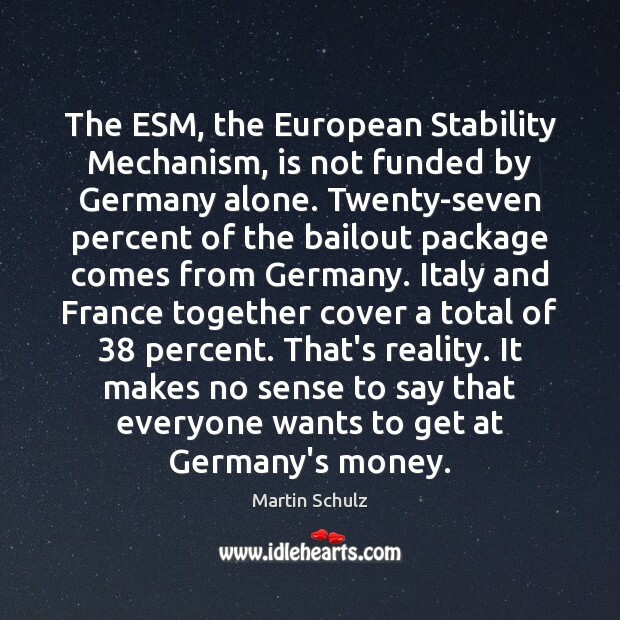 The ESM, the European Stability Mechanism, is not funded by Germany alone. Twenty-seven percent of the bailout package comes from Germany. Italy and France together cover a total of 38 percent. That's reality. It makes no sense to say that everyone wants to get at Germany's money. 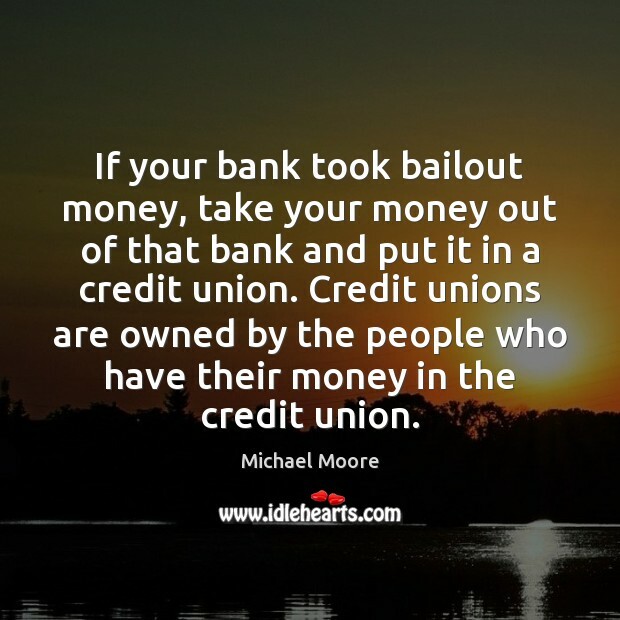 If your bank took bailout money, take your money out of that bank and put it in a credit union. Credit unions are owned by the people who have their money in the credit union. 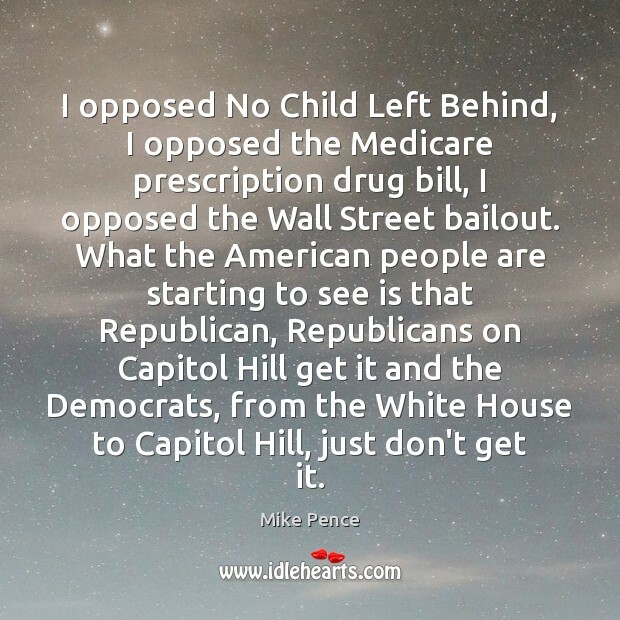 I opposed No Child Left Behind, I opposed the Medicare prescription drug bill, I opposed the Wall Street bailout. 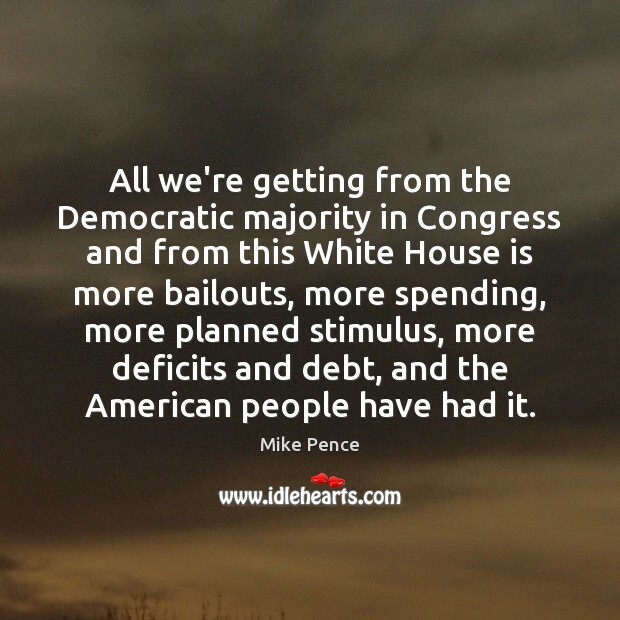 What the American people are starting to see is that Republican, Republicans on Capitol Hill get it and the Democrats, from the White House to Capitol Hill, just don't get it. 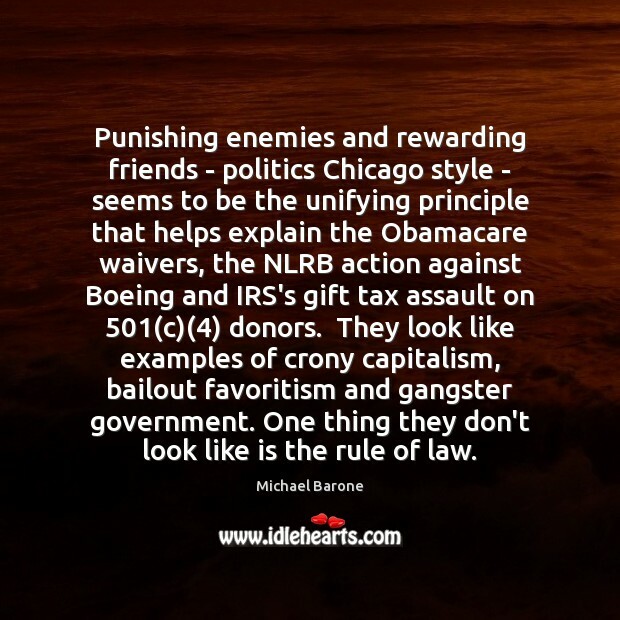 Punishing enemies and rewarding friends - politics Chicago style - seems to be the unifying principle that helps explain the Obamacare waivers, the NLRB action against Boeing and IRS's gift tax assault on 501(c)(4) donors. They look like examples of crony capitalism, bailout favoritism and gangster government. One thing they don't look like is the rule of law. 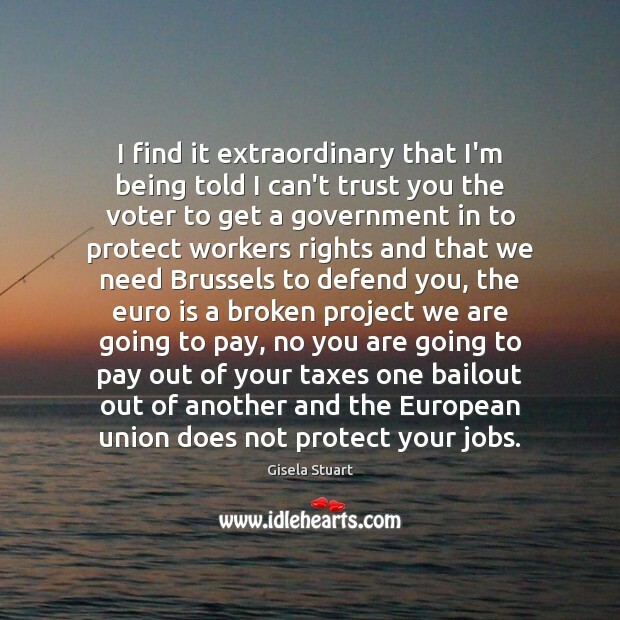 I find it extraordinary that I'm being told I can't trust you the voter to get a government in to protect workers rights and that we need Brussels to defend you, the euro is a broken project we are going to pay, no you are going to pay out of your taxes one bailout out of another and the European union does not protect your jobs. 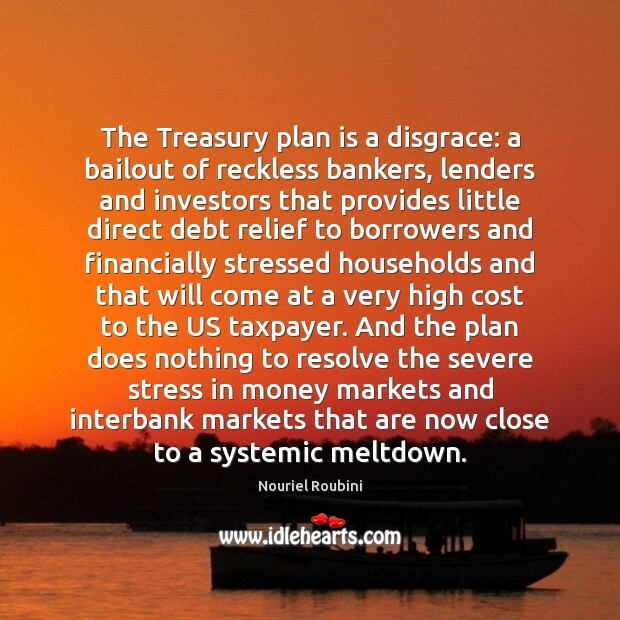 The Treasury plan is a disgrace: a bailout of reckless bankers, lenders and investors that provides little direct debt relief to borrowers and financially stressed households and that will come at a very high cost to the US taxpayer. And the plan does nothing to resolve the severe stress in money markets and interbank markets that are now close to a systemic meltdown. 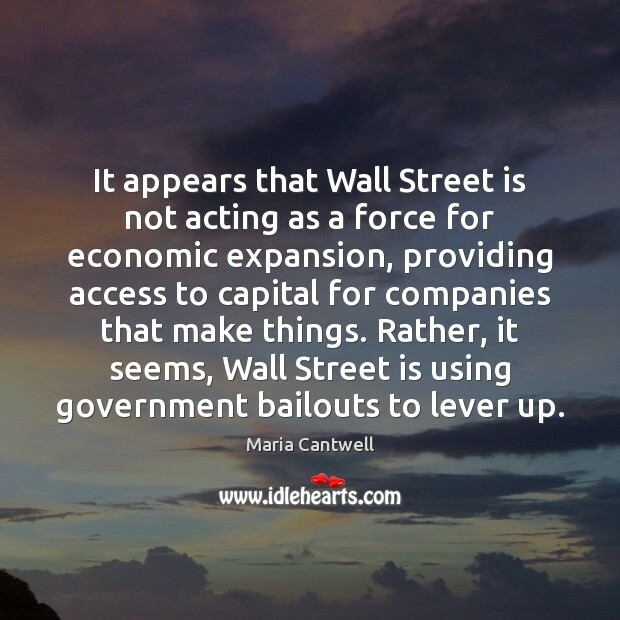 Financial institutions are not being bailed out as a favor to them or their stockholders. In fact, stockholders have come out worse off after some bailouts. The real point is to avoid a major contraction of credit that could cause major downturns in output and employment, ruining millions of people, far beyond the financial institutions involved. 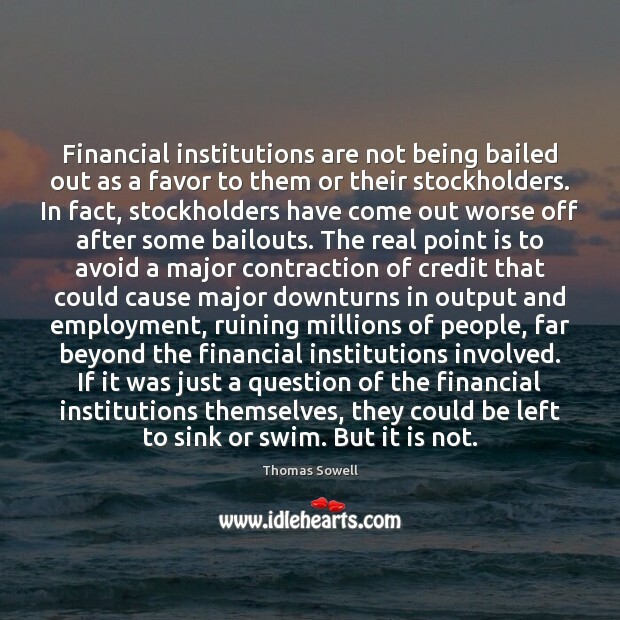 If it was just a question of the financial institutions themselves, they could be left to sink or swim. But it is not. 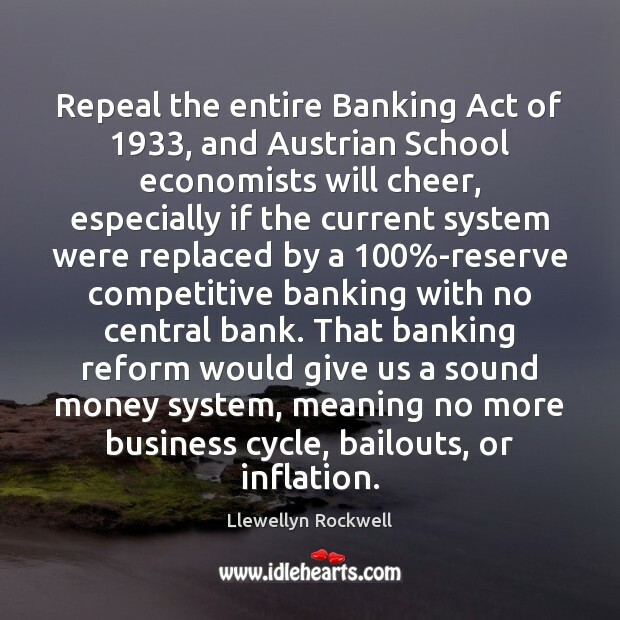 Repeal the entire Banking Act of 1933, and Austrian School economists will cheer, especially if the current system were replaced by a 100%-reserve competitive banking with no central bank. That banking reform would give us a sound money system, meaning no more business cycle, bailouts, or inflation. 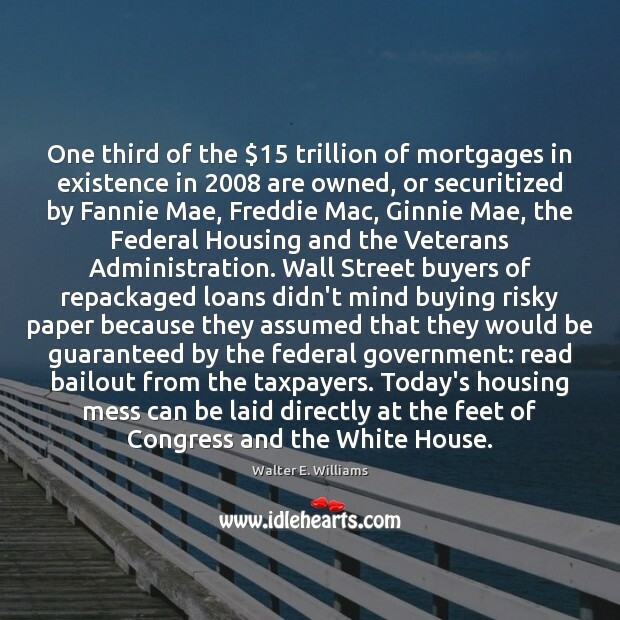 One third of the $15 trillion of mortgages in existence in 2008 are owned, or securitized by Fannie Mae, Freddie Mac, Ginnie Mae, the Federal Housing and the Veterans Administration. Wall Street buyers of repackaged loans didn't mind buying risky paper because they assumed that they would be guaranteed by the federal government: read bailout from the taxpayers. Today's housing mess can be laid directly at the feet of Congress and the White House. 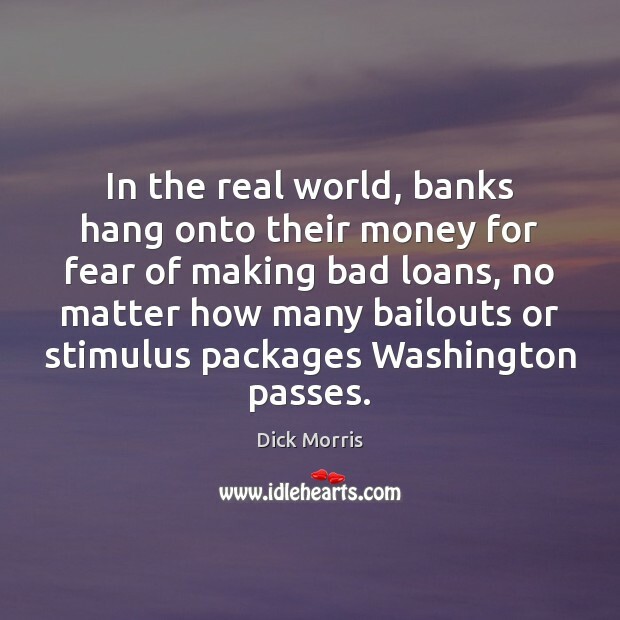 In the real world, banks hang onto their money for fear of making bad loans, no matter how many bailouts or stimulus packages Washington passes.